We have had a great first week of school! All of the hard work that our faculty did to prepare for the year was evident throughout the school, and all of our Bixby students were hard at work getting back into the groove of school. As we start this year together, I wanted to share with you our school priorities for the year and what that means for your students. 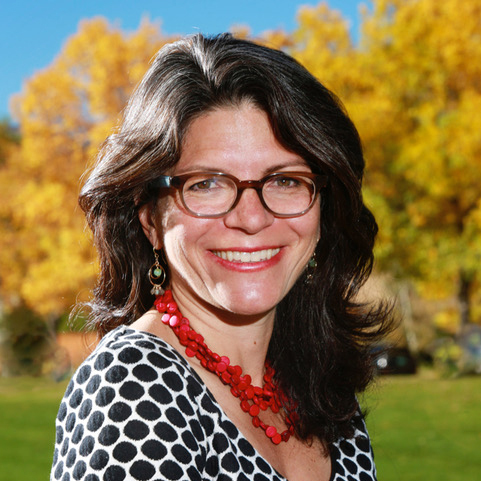 In particular, I want to share with you the work we are doing to strengthen our positive school culture, and why. Thank you in advance for reading! 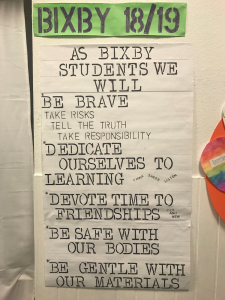 During the week before school, our faculty talked about Bixby’s history and its future. In particular, we spoke about the purpose behind everything at Bixby, and the power of that purpose. There is a clear WHY in everything that we do. 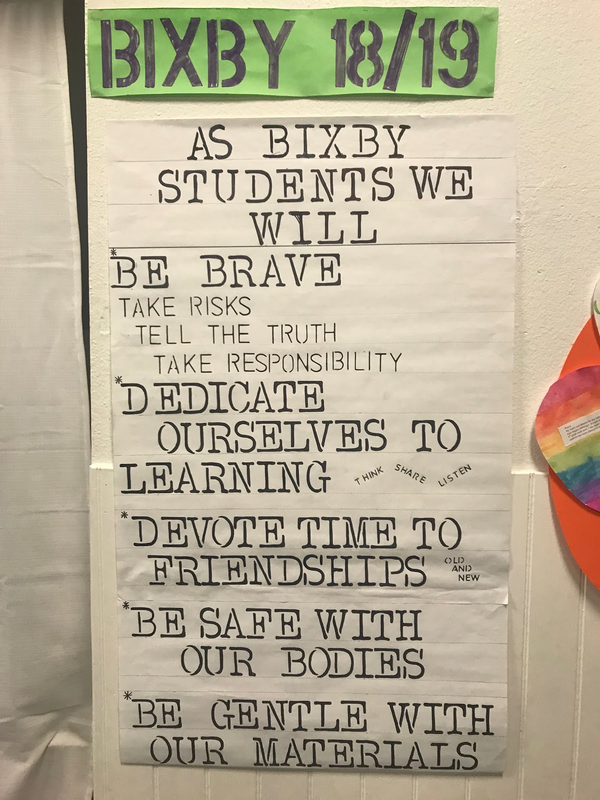 Bixby was founded in 1970 around a set of beliefs about the power of children, how they learn and what they are capable of doing and becoming. In many ways, these beliefs were a reflection of that era, and in many ways were unique and forward looking. For 40 plus years since then, our co-founders, Pat and Bart, led Bixby with a clear sense of purpose in every element of our school – from the elementary schedule, to faculty characteristics, inclusion of before/after care, swimming and more. Each of the elements of our school has a purpose and each part of our school works in terms of growing creative, independent adults who are great human beings. We know this because our alumni and our families not only tell us but also show us in terms of who they are, and in their relationship to this school. We all are custodians of Bixby’s purpose today. We are working hard to nurture all of the things that are special and unique about Bixby, even as we introduce some changes to respond to the world around us and our families. Some of the changes at Bixby this year are the same ones that happen every year – students enter a new grade, some kids are taller, some have new teeth and new summer adventures. There is also some change that probably feels different than other years. This week we worked with our elementary students upon the third area of focus. If you have a child in 1st-5th grade, you may have heard from your child “there are all of these new rules!” or “the tour was so boring!” or “Bixby feels different this year.” Hopefully, some of you also heard “I really like my new teacher and my new classmates” or “Amber’s lunch was awesome!”. Our goal is to set the foundation for a year of independent thinking and creativity for our kids by creating a clear playground of community behavior expectations within which to learn and explore. We did this by relying upon the principles of Responsive Classroom and combining them with the rituals and practices we already have at Bixby. We believe that these consistent routines in our classrooms and in our school will create more time for learning, more space for independence and more creativity and fun! Doing this work in the beginning is an important step towards planning for a great year. Today our K-5 students had a chance to reflect on their work this week as a community. 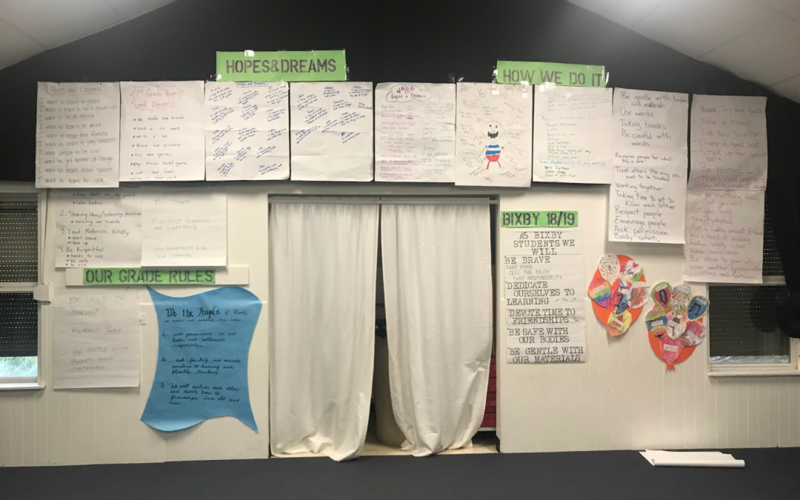 Each class shared their “Hopes and Dreams”. All of these were then synthesized into a set of shared Bixby Rules for 2018/19. I am so proud of our administrators and teachers for working so hard to make this year a great one. Thank you to your children for being open to change and willing to see what new important experiences might happen as a result. As hard as change can feel, being afraid to try out new things will mean nothing ever changes, and also that new, and perhaps important things are missed. The important things that make us who we are as a community will not change. If they ever feel like they are changing, I hope and expect that our students and families will tell us. Thank you for trusting us to partner with your family!